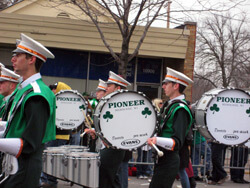 Well known in the drum corps community for their Irish-themed programs and tradition, the Pioneer celebrated with the luck of the Irish while marching down the streets of Chicago last Sunday for the 30th annual South Side Irish St. Patrick's Day Parade. "We've been marching in St. Patrick's Day parades since 1961 so this is of course nothing unusual for us," said Pioneer Director Roman Blenski. The corps schedules its monthly rehearsal camp in conjunction with the date to be able to draw a full roster of corps members for the parade ensemble. The south side of Chicago is a section of the city known for its high concentration of Irish decedents. One of two annual St. Patrick's Day parades in the city, the South Side Parade has been a fixture since 1979 according to the parade's official Web site. According to Blenski, as one of Pioneer's first uniformed public performances of the new drum corps season, "This is a good opportunity for us to make sure that the uniforms fit, and it's a general wake-up call to the members after a long winter to realize what it's like to be moving and playing again and carrying their instruments." He says that each year Pioneer brings up the end of the parade allowing for rehearsal time in the morning prior to the step off. "By the time we get downtown, the parade spectators are really into it; cheering and screaming. The corps members get a big kick out of the performance opportunity." View a photo gallery from the parade.